IMG_1049, originally uploaded by Paradise in Portugal. 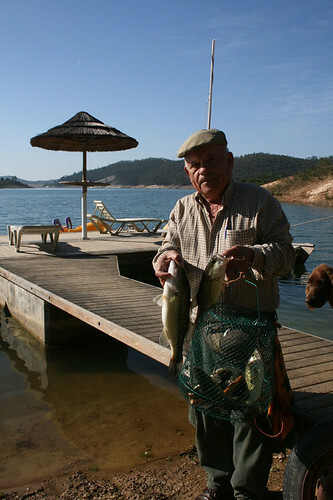 The Wide-mouthed Bass World Champion, Paulo Jorge Ramos, lives in Santa Clara and is regularly taking the Quinta’s guests fishing for this marvelous sports species this year. 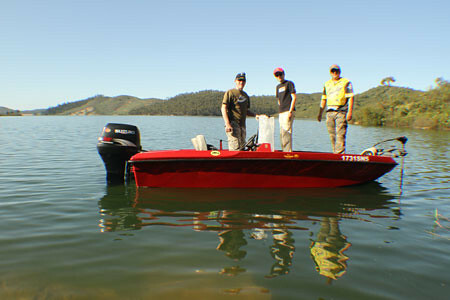 This picture shows him picking up Christophe and Alexandre Normand from France at the Quinta’s dock for a day’s outing. I’m often asked whether there are any fish in the lake; this little clip should provide the answer. I took it this morning while waiting for the Kingfisher to show up, but I think it’s too fat to fly at the moment! Achigan-20090314, originally uploaded by Paradise in Portugal. …. and this morning this chap caught these Wide mouthed Bass off the pontoon. They’re very good eating and a prized game fish in the States, though little known this side of the Atlantic. In Portugal they’re known as Achigan; the origin of the word apparently is “Michigan” as the first imported fish to Portugal came from the lake of that name. In the meantime, Pesca, the Quinta’s German Long haired Pointer, looks on in hope that he’ll drop a fish before he can get them back in the keep net …. Carp-20090313, originally uploaded by Paradise in Portugal. We get many enquiries regarding fishing at the Quinta, so the above piccie is just to show you what’s available. This local lad popped in half an hour ago just for a quick cast or two before the weekend and pulled this one out within half an hour – he caught others as well, mainly Wide-mouthed Bass. He said the trick was not to waste time casting all over the place but wait until one sees them …. which says something about the water clarity hereabouts!